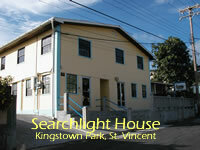 The newspaper Searchlight is published by Interactive Media Limited, which was incorporated in St. Vincent and the Grenadines on March 7, 1995. Searchlight is published on Tuesdays and Fridays. Our Weekend publication is published in hard copy and as an e-paper, while our Midweek paper is published as an e-paper only. Today, the company is owned by 20 shareholders and is staffed by 16 full-time and one part-time employee. We are an independent news organization, and strive at all times to produce balanced reports which reflect independence of thought.